A curved screen? Meh. 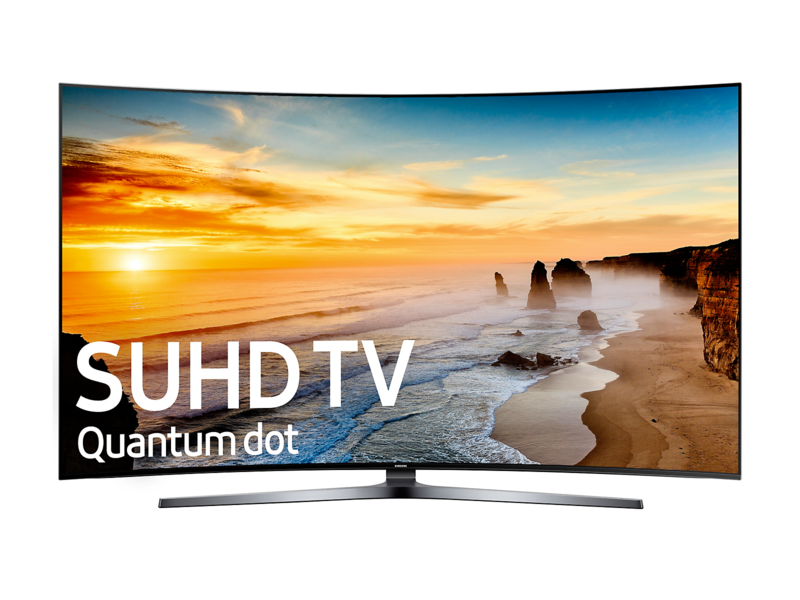 But HDR and quantum dots result in an LCD TV that gives uber-expensive OLED technology a run for its money. We get pitched on a lot of new products and technologies here at TechHive. Every now and then, something great pops up. But most of the better mousetraps we see are over-hyped and/or relatively trivial. You might say we’ve become a bit jaded about it. Keep in mind, these aren’t high-school kids, but seasoned professional journalists. The combination of HDR’s heightened contrast and dynamics and quantum-dot technology elicited the oohs and ahs, not just the extra pixels in the 3840 x 2160 display. 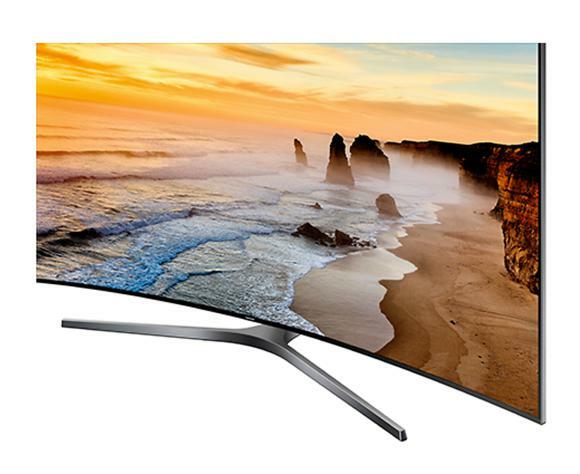 In short, the UN65KS9800 made believers out of the 4K UHD and HDR skeptics around here. HDR isn’t this year’s 3D, it’s a genuine improvement in TV technology. 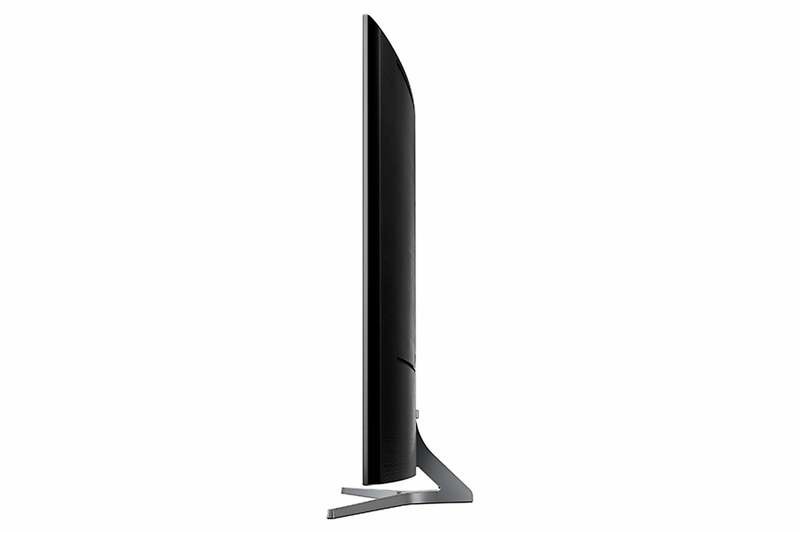 The UN65KS9800 is a 65-inch class (64.5-inch), 120Hz LCD panel with about a 3-inch curve. The wall weight is around 62 pounds, and the 14-inch-deep stand adds another 7 pounds. There are four HDMI 2.0a inputs, each of which supports HDCP 2.2, and one of which provides ARC (audio return channel) for connecting the TV to an external sound system (a sound bar, an A/V receiver, or what have you). The TV itself has just three ports, which are covered by a removable panel in this photo. The rest are housed in a breakout box. Those connections are not on the TV itself but in a convenient breakout box that Samsung calls OneConnect+. The box also harbors two USB ports and an RS-232 port for integration with high-end control systems. Only the ethernet, power, a single USB port, and the OneConnect+ cable port reside on the TV itself. The KS9800 is pretty straightforward to set up, but the previous reviewer kept the users’ guide, so it was only vague recollection reminding us that the remote control’s only infrared function is on/off. To gain access to the rest of its functions during first-time setup, you need to pair the remote and the TV via Bluetooth, using a small, not-easy-to-see button next to the battery on the inside of the remote. After having dealing with another vendor’s somewhat clunky Android interface and old-school remote, using the KS9800 was a joy. The remote sports only a few buttons, feels great in your hand, and the on-screen interface is simple and logically laid out. You can get to the picture settings at any time, and both keyboard (USB and Bluetooth) and mouse are supported. Bluetooth gamepads are supported as well. Our only complaint is the absence of fast-forward and rewind buttons. There is such a thing as too minimal. There are tons of picture tweaks for the KS9800, including expert settings for those who are particular about such things (or who can hire a professional to calibrate their TV). A nice touch is being able to set 8/10-bit color individually for each of the four HDMI inputs. 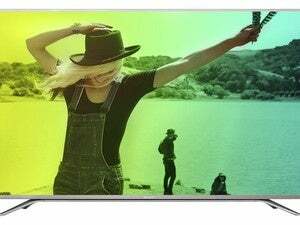 Said 10-bit color is the “10” in the HDR-10 standard that Samsung refers to as HDR 1000. The 1000 is to call out the display’s supposed maximum brightness of 1000 nits, we’re told. We measured 558 nits on a bright white screen with everything maxed out. That’s about 100 nits brighter than the best you’ll see from most LED/LCD TVs. Perhaps you need to used HDR material to see 1000. 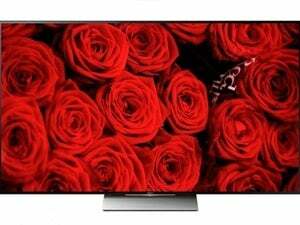 The KS9800 features the cream of non-OLED image technologies: quantum dots, full array backlighting, local dimming, and more. The color is fantastic, extremely accurate, and—at least with HDR material—superbly saturated. The TV does a very good job upscaling lower-resolution material as well. The display you’re reading this article on is most likely not capable of showing how good the KS9800 is. The KS9800’s blacks are also outstanding, if not OLED-like; the HDR effect really adds a jolt to the overall experience. Motion is super smooth, too. Lest I sound like a Samsung shill, I did encounter some wide area blooming with light objects on dark backgrounds. 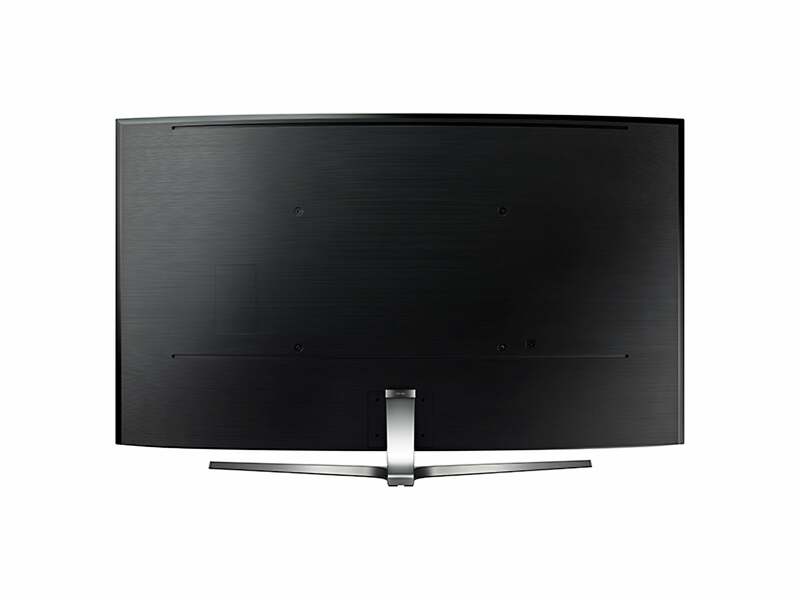 But what was annoyingly obvious with the last Samsung SUHD TV I tested is much less noticeable onthis one. The effect only rears its head once in a blue moon, but it’s a reminder that LED-backlit LCD technology isn’t yet perfect. 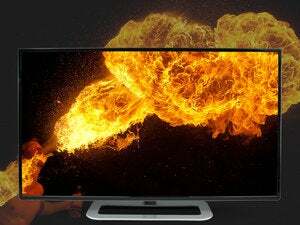 HDR-10 vs. Dolby Vision: Is one HDR implementation superior to the other? If you bought one of last year’s SUHD TVs and are considering an upgrade, you should be aware that those models can be upgraded to HDMI 2.0a, which is required by HDR-10, and those TVs have the chops to display HDR-10 to good effect.There is no support for Dolby Vision, with its dynamic metadata, in any SUHD TV; and there’s no way to know at the moment whether any will be able to handle dynamic metadata in the future. Even if not, HDR-10 looks pretty darn good. In this profile photo, the 3.0-inch curve in the KS9800’s chassis makes the TV look thicker than it actually is. 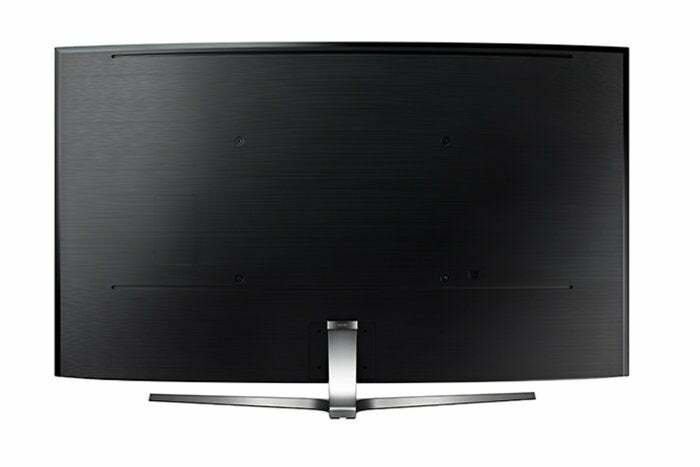 The KS9800 not only has one of the best pictures in the industry, it’s also one of the best-sounding TVs we’ve heard, putting out decent bass and treble and good definition. The upshot is that you probably won’t feel instantly compelled to supplement it with an A/V receiver, sound bar, or home theater in a box. The onboard amp is a rather hefty 60-watt 4.2 channel type, and the TV can decode Dolby Digital Plus, DTS Premium Sound 5.1, and DTS Studio sound. There is no support for the high-definition codecs used on Blu-ray discs, such as Dolby TrueHD, DTS HD Master Audio, or the object-oriented Dolby Atmos or DTS:X. Okay, $3500 ain’t chicken feed. But the KS9800 gives OLED a run for its money in terms of color and contrast; and from what I’ve seen, it shows fine detail considerably better. The blacks aren’t quite as dark, but HDR content makes this difference barely noticeable. I can’t tell you how much you want to spend, or if it’s the right time to go HDR in a world still dominated by 720/1080p, standard dynamic range content. But I can tell you that when real 4K UHD HDR content starts replacing the overly compressed or upscaled 1080 junk currently being streamed, you won’t be sorry you bought a KS9800. Color us impressed, and then some. Watching high-quality 4K UHD HDR video on this TV shows what all the fuss is about. It's pricey, but you get what you pay for, or at least you will when more HDR content becomes available.